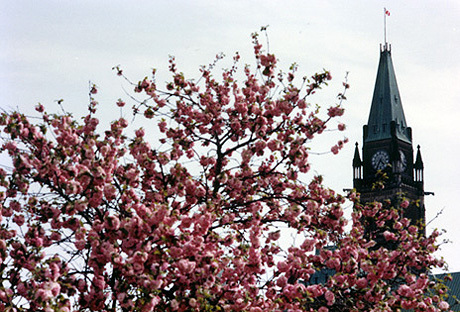 Trees and tulips were in full bloom last week in Canada’s capital Ottawa as re-elected Prime Minister Stephen Harper unveiled his new Cabinet of ministers. Mr Harper’s Conservative Party won a solid victory in the May 2nd Canadian federal election, taking 166 ridings out of the 308 comprising the House of Commons. This was Canada’s fourth election in the last seven years, and the first majority government since the 2000 victory by then Liberal PM Jean Chretien. The only sour note for the Conservatives was its showing in the province of Québec, where support declined, and its total of elected MPs fell from 10 down to five. The biggest losers nationally were the Liberal Party and its leader Michael Ignatieff. The Liberals, known for decades by commentators as “Canada’s naturally governing party”, were reduced to their all-time low, falling from 77 seats in the previous election down to 34. Mr Ignatieff resigned as leader on May 3rd, quickly accepting a university teaching post. The Liberals appointed Bob Rae as their interim leader, but have not yet set their sights on any soul searching or long-term planning. The other biggest losers were the Bloc Québécois and its leader Gilles Duceppe. The BQ runs candidates only in the province of Québec. For some 20 years, it had pushed for its pro-sovereignty agenda while maintaining at every possible occasion that Québec is a victim of the federal system. This time around, the province’s voters got tired of the old music, and dealt a crushing blow to the Bloc, reducing their seat total from 49 of the 75 ridings in Québec down to only four. Duceppe did come first in the resignation game, however, quitting as leader a good 12 hours earlier than did Mr Ignatieff. And at least from now on the Bloc will be able to economize by renting a car instead of a bus for parliamentary caucus functions. Jack Layton, leader of the New Democratic Party (NDP), presented a very strong election campaign calling on citizens to abandon Conservatives’ and Liberals’ “old policies”. Although the NDP’s advertising spots did not shy from criticizing other parties, they tended to do so with a touch of humour compared with the nastiness of messages which ran for the other parties. Mr Layton campaigned following health setbacks (prostate cancer treatment) and recent hip surgery. Looking increasingly fit as the campaign wore on, the cane Mr Layton had to lean on heavily at the outset became more of a prop and underdog symbol by the end of the race. No one would have expected when the election was called five weeks earlier that the NDP would come in second place, winning 103 ridings, compared with their 37 in the last Parliament. Even more stunning was that out of the 103 total, 59 new NDP MPs were elected in Québec, up from their previous total of one. Turning to the Cabinet, the new 39-member Conservative ministry is one of the largest in many years. Its size has led to some criticism in of that many were expecting a smaller group of perhaps 22 or 24 members to show a lean approach to dealing with Canada’s debt and economic recovery in the years ahead. Nevertheless, selection of a Cabinet is always a difficult task in Canada where the PM must try to balance the need to have strong and competent persons in charge of the various government departments against demands for representation along language, regional, ethnic and gender lines. Mr Harper’s selection of ministers shows a well-crafted consideration of all these issues. He has put together a balanced team with probably the highest level of representation of minority groups and new Canadians compared with any previous government. In the case of Québec, Mr Harper showed respect for its voters by appointing to the Cabinet four of the five Conservative members elected in the province. It would have been a likely impossible task to reflect all of these interests and keep the Cabinet team down to 24 or so ministers. This writer will therefore give the PM benefit of the doubt on the size of Cabinet issue. During the election campaign, it was alleged by BQ leader Duceppe and others that Mr Harper had a hidden right-wing agenda. On election night and thereafter, the Prime Minister took pains to reject this claim. He stated that his government would stick to its program, knowing well that Canadians would not react favourably to radical deviations from stated policies. As an important indicator of stability, Mr Harper kept several key posts the same: Peter MacKay at National Defence, Rob Nicolson at Justice, Vic Toews at Public Security, Jim Flaherty at Finance, Jason Kenney at Citizenship and Immigration, and Rona Ambrose at Public Works and Government Services . The main change sees John Baird promoted to Foreign Affairs necessitated by the electoral defeat of the well-respected Lawrence Cannon. Mr Baird was characterized by some opposition members and journalists as being somewhat partisan, so it will be interesting to see how he rates in Foreign Affairs a year or so from now. A majority government should help engender stability. The new Official Opposition of Mr Layton’s left-leaning NDP should be an effective balance against the Conservative government. The government now has a golden opportunity to demonstrate its claimed expertise dealing with economic management as well as international and national political concerns. The previous administration of Mr Harper had to deal with a minority situation in Parliament. In some respects, his team appeared almost desperate to try to implement their ideas as fast as possible against the constant threat of possible removal from office. Now that according to law the next election will not take place until October 2015, the government will have the opportunity to breathe a little, think a little more deeply, and look at the larger picture. What we hope will come to pass will be a more comprehensive approach to law-making, rather than the piecemeal statecraft which seemed to characterize the last administration. Canada, and to some extent the world, would be the better for it.